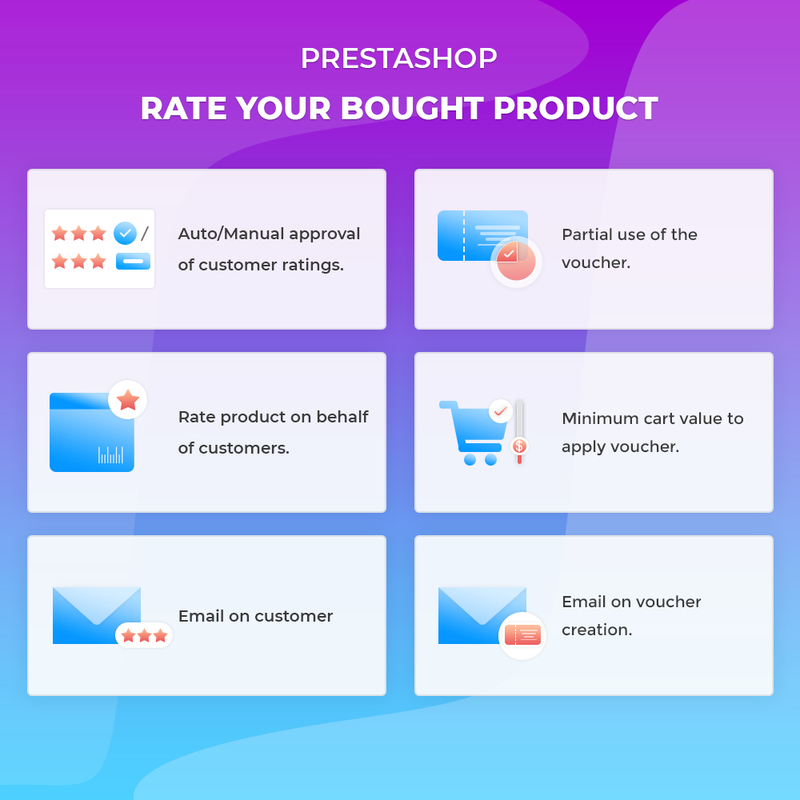 Prestashop Rate Your Bought Product : Product rating is one of the most important factors which can influence the purchase decision of customers. With this module, customers can rate their bought products which will be displayed on the product page for reference for further buyers. A reward voucher for the customers for giving the product review further helps admin in generating more traffic to the store and thus increasing sales conversion. 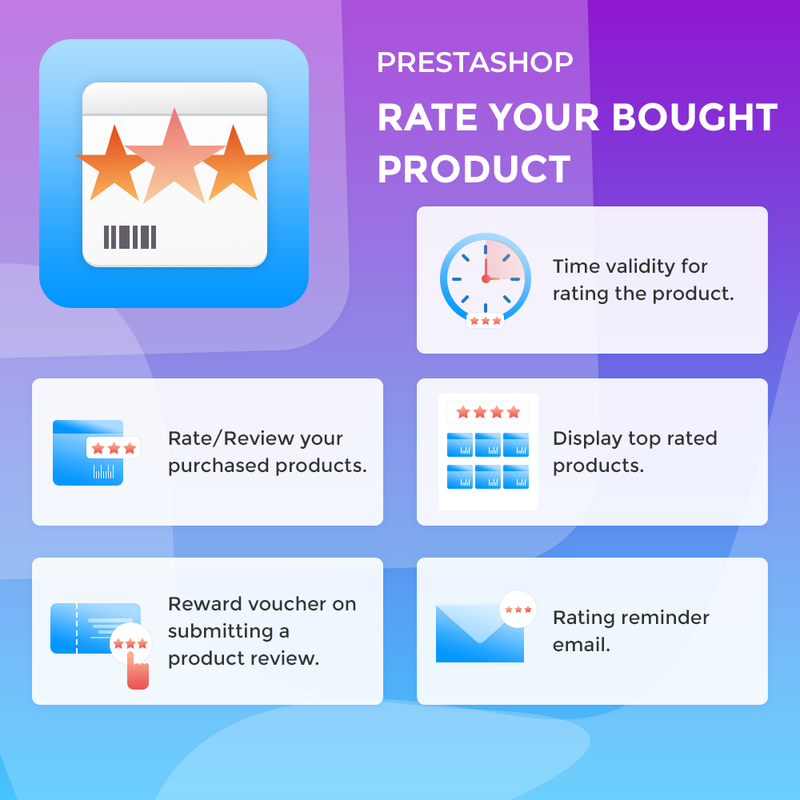 Prestashop Rate Your Bought Product - "Ratings and Reviews are an increasingly important part of the purchase journey for online consumers.". With this module, customers can rate their bought products which will be displayed on the product page for reference for other buyers. A reward voucher for the customers for giving the product review further helps admin in generating more traffic to the store and thus increasing sales conversion. Better product ratings tend to attract customers as other customers experiences with the product seems reliable to the new customers. previous reviews of customers highlighting features of a product help other customers to decide better. Encourage your customers for submitting a review by giving them a discount voucher for each rating & review. Define a timeline for the voucher under which it needs to be used for buying other products & decide the amount of voucher according to price of product on which customer has given rating & review. Upon rating a product, an email notification is sent to the customer about rating. 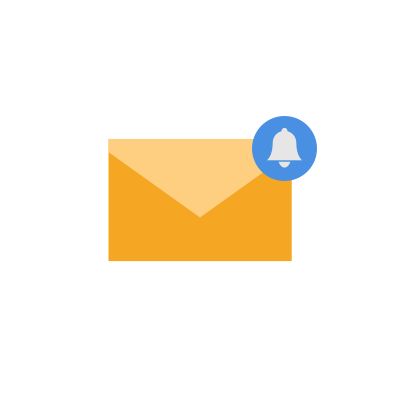 if admin has enabled voucher creation on submitting a review, then another email notification confirming about the same would also be sent to the customer. 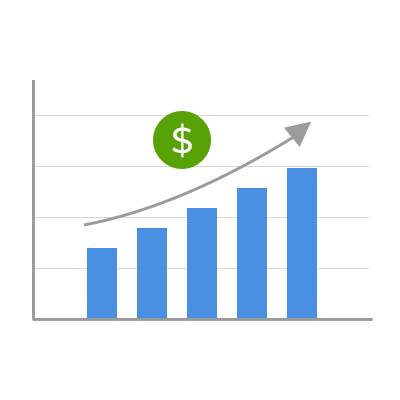 Did you buy Prestashop Rate Your Bought Product?